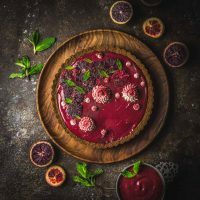 Our ruby-hued blood orange and hibiscus curd makes a delicious and luscious filling for this beautiful seasonal tart. The crust is made from crushed gingersnap cookies, and couldn’t be simpler. With a great balance between sweet, tart and spicy, this is a real showstopper of a dessert. 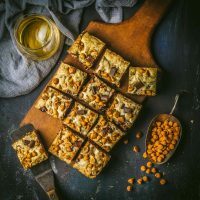 No longer the boring cousin of the brownie, these blondies are packed with tons of flavor from brown butter, toasted hazelnuts, chocolate chunks, butterscotch chips and a healthy splash of bourbon. These braised short ribs are cooked low and slow in a delectable sauce flavored with soy, honey, orange and Chinese 5-spice powder. A hearty cold-weather recipe! As a cooking couple, we’re aware of a lot of the clichés that link food with romance. The way to a man’s heart is through his stomach. The couple that braises together…stayses together. You know, the classics. It is true that if you can work together and communicate well in the kitchen, if you can appreciate each other’s skills and enjoy your combined successes, and if you can laugh at and learn from your culinary failures, your relationship probably has a pretty solid footing. It helps to have a recipe like this braised short ribs dish. 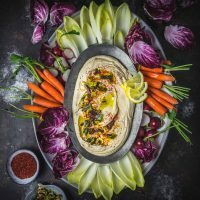 There are a few steps to it, but nothing is time-critical, so you can hang out in the kitchen and talk about how your day was while you do the prep and get the ribs in the oven or slow cooker. Note: This recipe is part of our on-going series with Serious Eats. You can also find this recipe, and other great ones, on their site. read article and get recipeget recipe! Creamy peanut butter buttercream sandwiched between two moist, fudgey brownies, rolled in crushed salted peanuts. Simply the most delicious cookies we’ve ever made. 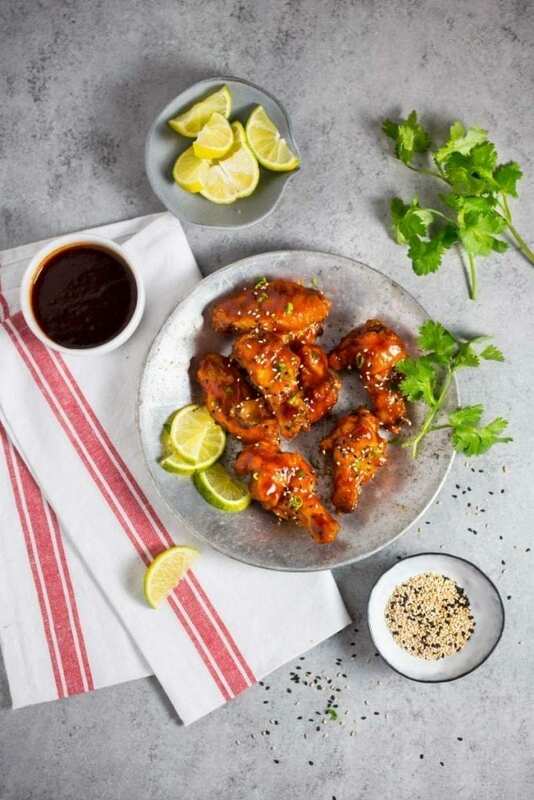 Seriously crispy and coated with a sweet and spicy Sriracha-honey glaze, these oven-baked wings rival fried ones any day. This is game day food done right. I’m pretty sure you haven’t come to a site called “Nerds with Knives” expecting sports talk because we are not sporty people. Any yelling and screaming you might hear from our house on a late Sunday afternoon is more likely to be about the crossword puzzle than the N.F.L. – and, just an aside to Will Shortz at the New York Times, there had better not be too many sports related questions or these two bespectacled nerds will not be happy. But just because we don’t know a touchdown from a layup doesn’t mean we don’t know game day snacks. That, we have covered. We got your spicy meatballs, your savory meatballs, your mini shrimp cakes, your spiced and candied peanuts. And now… these wings. 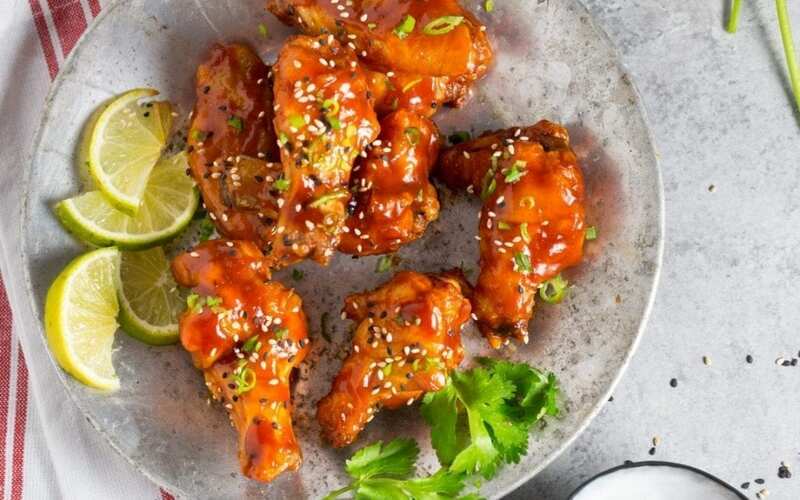 Truly crispy wings with a sticky, sweet and spicy glaze. And the best part? They’re baked, not fried. A hearty family roast, done right, is a cause for celebration – and a great reason to know your local butcher! 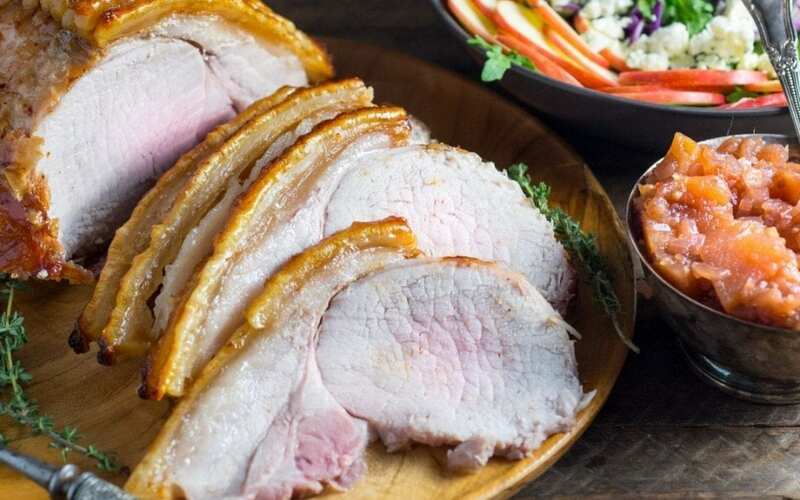 This roasted pork loin is flavored with herbs and served with spiced apple chutney. And look at that crackling! As a Brit living in the US, there are times when I’m asked to explain a particularly confusing aspect of my native culture. One of these is the age-old conundrum of what, exactly, is the difference between lunch, dinner, tea, and supper, and how and when the terms can be used interchangeably. 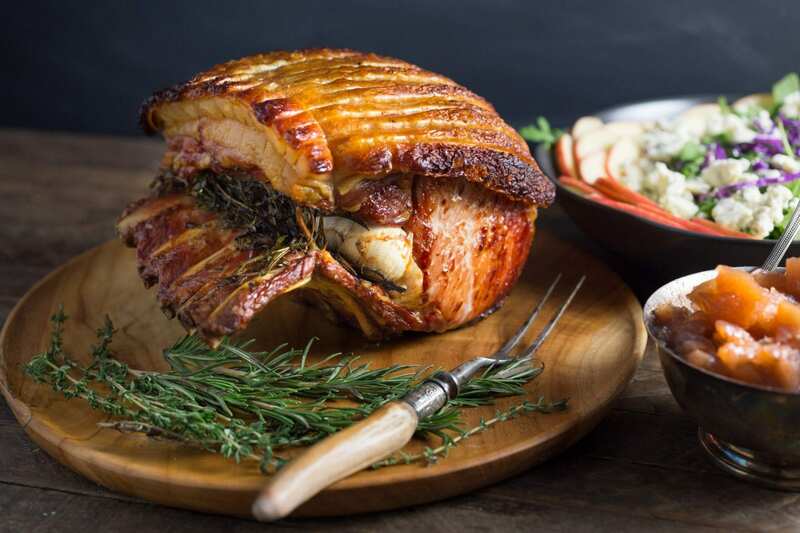 The full answer requires a lot of hand-waving about geography, generational differences, and social class, but inevitably will touch at some point upon the concept of a Sunday lunch which is often a large family gathering involving a roast of some kind, at which the most important element, by far, is crackling. Note: This recipe is part of our series with Serious Eats. You can also find this, and other fantastic recipes on their site! 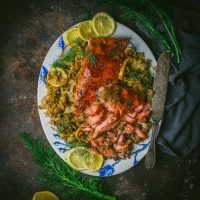 Flaky, moist salmon with perfectly crisp skin, sitting on a bed of creamy lemon rice. It might look fancy but it’s a cinch to make, even on a weeknight. Hey, you! Our old buddy! You made it out of 2016! Us too – and look, Nerds with Knives is exactly where you left it, a little battered, a little bruised perhaps, but we made it to the other side of the timeline mostly intact. Now, don’t get alarmed, but we’ve moved a few things around. We’re on new hosting, which won’t affect your NWK experience too much (perhaps a little faster, do you think? ), we have a new ad partner, and we are now Pinteresting like never before. You can visit and follow us here. Other than that, it’s still just the two of us wombling along making things to eat and hoping you like them. I know that the food trends in the beginning of January are all about salads and smoothies (and salad smoothies and smoothie salad bowls, etc), but we decided to go in a different direction. It’s 19 degrees and snowing tonight and while I like a good smoothie as much as the next food blogger, I want something warm and comforting as well as healthy for dinner.